ONCE UPON A TIME there was a catalog of monsters that some people hated and some people loved. So begins the Introduction to the soon to be released Book of Fiends, the first supplement for Seven Voyages of Zylarthen. Two other supplements are currently close to completion - one is a complement to both Zylarthen and Book of Fiends, featuring new (sort of) spells and various miscellaneous additional rules, from tables on age and aging to how to use teleportation in outer space. It will be available as both a stand-alone booklet or as additional material for an expanded E-version of Seven Voyages of Zylarthen. The other is the long-awaited (for me) Sleeping Beauty's Dungeon. Book of Fiends is an OGL and SRD compatible version of, you know, that book, yes that one with the blue cover and the scary/silly monster holding that big sword - the book you either hate or love. A few months ago, unsolicited by me, my young son discovered this catalog, adopting it as his favorite “adult” book in a way that I assume a child of the 19th century might have taken to Grimm’s Fairytales. Through him I rediscovered it and very quickly decided that it would be fun to re-imagine the work for the world of SEVEN VOYAGES of ZYLARTHEN. Every monster in the original book is represented here—at least in some form. But partly for legal reasons (though not entirely because of them), many of the creatures, including their names, are quite different from their previous descriptions, if not in some cases unrecognizable. Why another book of monsters? Well, why not another book of monsters? The original fantasy adventure game was not a “closed system,” but rather a magic box that promised unlimited possibilities for mystery and delight. Or so it seemed to each one of us at the time. The game should always be fresh. Book of Fiends may be viewed in that spirit. As far as I know, no one has riffed off of the book before, at least in any methodical manner, which is one of the reasons why I decided to try it. 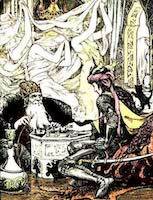 But I also found the tone of the original book conducive to the vibe I was trying to create with Zylarthen, recreating what I saw as the vibe of OD&D - not Chainmail set in Middle-Earth but Narnia plus Dinosaurs and Robots, as I wrote once. Or now I suppose I should add, Narnia, plus Dinosaurs, Robots, Strange Gods, inhabitants of Pluto and the other outer planets, Coffer Corpses and Maggot Men. Book of Fiends increases the store of Zylarthen monsters by over 50%, adding close to 200 to the canon. In terms of pages, it's actually slightly longer than Zylarthen's Book of Monsters. The first preview highlights seven new gods and goddesses, rounding out the total number of those entities to 27. Were these in the original 1981 book with the blue cover? One was, though she has a different name. The others are substitutes for a set of related creatures that I decided not to map for legal and other reasons. But you might still say they are versions of a set of entities in that original book. As with the first 20 gods of Zylarthen, most of the new gods are taken from myth or fantasy fiction. Enjoy! ANU LORD OF THE SKY: Anu is said to be the patron of all good kings and the guarantor of their authority. He is also the guardian of justice and enforcer for the punishment of criminals. He appears on earth as a champion wearing a horned crown, and any encounter may include some form of moral test. His daughter, Lamashtu, is a hideous beast-demon with the head of a lion and the feat and talons of a bird. Recently, a respected sage claimed that the major temples of Anu had been thoroughly infiltrated by secret adherents of Lamashtu. Unfortunately, the sage was killed before elaborating further. BLACK WIDOW GODDESS: This thoroughly malign entity used to be of human appearance until an attempt to take her own life out of hatred and self-absorption caused her to be transformed into a giant spider. She is worshipped by the Black Elves, and thus the higher gods occasionally allow her to take the form of a Black Elf maiden. Whether this is out of mercy or caprice is unknown, but it inflames her hatred of the other gods as well as of most creatures and things not associated with the Under-Earth. She is usually encountered under her more hideous guise, accompanied, of course, by spiders. HANUMAN THE ACCURSED: The Temple of Hanuman features a statue of a hideous giant ape, made out of black marble with glowing rubies for eyes. Though the statue is inanimate, the stone will be felt to slither if touched. During the day, many will make gifts of various kinds to placate this deity. But after nightfall, all with give the Temple and its priests a wide berth. PTAH LORD OF THE SPACE BETWEEN WORLDS: Whether Ptah is a true God, or merely a powerful and ancient extra-solar astronaut is perhaps unimportant. It is said that High Priests of this entity are granted the ability to safely travel to other planets and even stars. It is also claimed that strange “visitors” often frequent their temples. It was a devotee of Ptah who first invented the perspective tube, a device that allows the user to observe far objects in space or see features on the surface of other bodies—such as the spiraling towers of the Selenites or the artificial waterways of Mars. RAN: Ran the ocean goddess is said to delight in shipwrecks and deaths upon the sea. She appears as a woman swimming between the waves, holding a net that she uses to lure mariners to their doom. 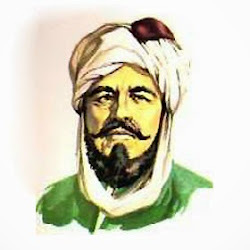 Sailors often darkly joke about being favored by her: “Now on Ran’s bed must I soon be a-lying.” But Ran is also said to love gold, and thus it is the practice of some to toss treasure into the ocean to placate her, perhaps before a storm. Cults of Ran usually erect their temples near dangerous reefs. SKADI: Skadi is the goddess of winter, snow, the mountains and hunting. 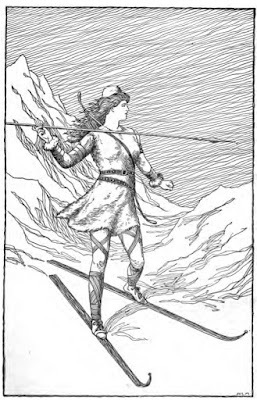 She usually appears as a beautiful maiden wearing skis. 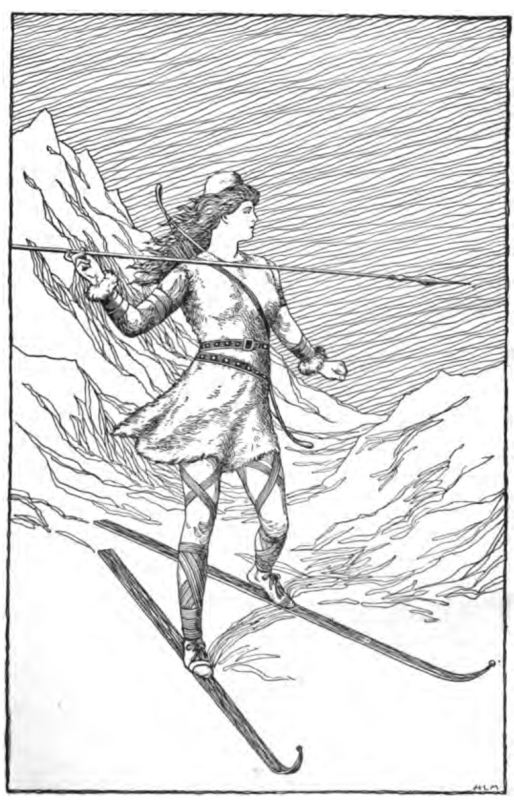 (In the world of SEVEN VOYAGES of ZYLARTHEN, skis are utilized by many of the Northern peoples.) It is said that if a mortal man succeeds in making Skadi laugh, he will be greatly rewarded. Failure may have other consequences. Hanuman!! Just think of all the adventurous types who want those rubies!